One of the best Disney World tips you will ever receive for avoiding long lines is to arrive at the Magic Kingdom, Epcot, Animal Kingdom or Disney's Hollywood Studios theme parks before they open for the day. Sometimes park opening is called arriving before "rope drop" because cast members (Disney employees) may hold ropes across the entrance of the theme parks - once the park opens, they may lower the rope or they may require guests to stay behind the rope and walk at a safe speed until you get a little ways into the park. Why Is Getting to the Theme Parks Early a Big Deal? The Disney World and Universal Orlando theme parks are at their least crowded in the first hour or two of the day. It is so much better to arrive early and take a mid-day break than to arrive late and get in line behind everyone else. During summer months, it is great if you can get to the parks at least 30 minutes prior to park opening, though 45 minutes is better. Wondering if it really makes a difference? Here are a list of stand-by times at Space Mountain at Magic Kingdom for a day where, on a scale of one-to-ten, the crowds were a seven (7) which is moderately high but not peak level. Don't you agree that a 16-minute line is just so much nicer than an 86-minute line? Yes, you can - and should - use FastPass+ to minimize lines but you are limited to only three FastPass+ reservations at the start of the day and then can only add one at a time after that. Getting to the park before it opens will let you experience those attractions that don't offer FastPass+ in a timely fashion. In fact, we often recommend that you don't schedule your first FastPass+ of the day until about 10:30AM so you can maximize the benefit. You can also enjoy less popular attractions, live entertainment and large capacity attractions in the middle of the day when the lines and heat are at their worst. Another good tactic is to head back to your resort mid-day to enjoy a swim and catch a nap to make up for that sleep you missed in the morning and then come back to the parks later in the day. But Why Do We Have to Arrive So Much Earlier than Park Opening? Arriving 30 to 45 minutes ahead of park opening may seem a bit extreme until you remember that there are somethings you have to do before they let you into the parks and getting from the parking lot or your Disney transportation stop to the front gates will take some time. You'll also have to pass through the security check point and admission turnstiles before entering the park. Disney Theme Park Security Point - Bag Check. Bag Check: It will save time if you have all of the compartments on your bags, purse, and camera bag opened and ready to go. Weapons are prohibited, of course, as well as glass containers and alcoholic beverages. Tip: Take a minute to scan the security and admission lines ahead of you as they aren't always equally busy. Look for families with lots of kids and bags that might cause one line to be shower than the others. If you're going to the effort of getting to the theme parks early, you'll definitely want to have a plan for at least the first few attractions you want to hit as soon as the park opens. Ideally, you should also have a park map in hand and know where the rides are located. If you don't know where you're headed, you'll feel stressed and you may get trampled by a determined guest pushing a stroller while you try to figure it out. Click here to read more about theme park touring plans. 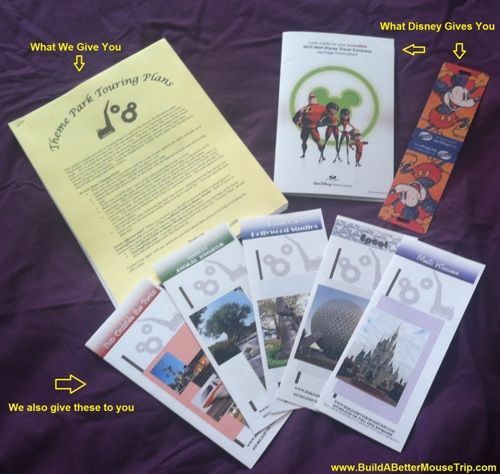 Every one of our clients gets theme park touring plans and a packet FULL of tips and information designed to help you have a better time in the parks. We tell you the best quick-service restaurants, "don't miss" live entertainment recommendations, fun freebies for each park, and more. Our hope is that these resources will make it easy for you to have a better Disney World experience...better food, shorter lines, and more happy memories. The best part is there is no extra cost when you book your trip through us. The Magic Kingdom has a sweet little "Welcome Show" each morning about 20 minutes prior to park opening. The mayor of Main Street USA and dancers will come out to greet the crowds and then one of the Walt Disney World Railroad trains will pull into the station carrying a bunch of Disney characters. It is a cute way to start your day. TIP: While being centered in front of the station will give you the best view of the Magic Kingdom Welcom Show, being to once side or the other put you closer to the arches everyone passes through to get into the park - giving you a bit of a head start to your first attraction of the day.